Dave proposed that I start a new feature wherein I obsess about the books I'm reading online, rather than at him, which is kind of hilarious, since he has only himself to blame. See, I used to be one of those people who did nothing but read, and even while riding in the backseat of the car at night, held my book up so that I could read by the flash of headlights from the car behind us. But then bookstores all went away, and I started knitting all the time, and it's pretty much impossible to read and hold a paperback at the same time, though believe me I've tried, and so it happened that I became way more versed in the world of hands-free entertainment--i.e. television. But then Dave bought me a Kindle. I had strenuously objected to Kindle-ownership for a very long time, not because of any high-falutin' notions that it was ruining the book industry (I am now a testament to how it is not) but just because I like books. I spill drinks on my books, I write notes in them, I smell them, I admire their covers (those of my books that have any left, anyway) I dog-ear pages and I read them again and again. A Kindle is a soulless object when compared with my Kool-Aid covered A Little Princess. But then I tried knitting with a Kindle. And lo and behold, it is possible. And then I went and bought a book, which I hadn't done in forever because I buy books in bookstores where I can sit on the floor and skim and flip through and, most importantly, take it home with me right then, not wait for it to be delivered. Buying a book on a Kindle is kind of like that, only you never have to worry about anybody tripping on you. That first book I bought was Code Name: Verity by Elizabeth Wein, and it seems likely that the extreme adoration I felt for Verity bled into my love for the Kindle in general, but there you are. In any case, it seems fitting that my first book for this feature is Elizabeth Wein's follow-up. I love epistolary novels. I love books about World War II. I love books that saturate you with information, while never being boring--from the types of planes flown to the fact that the Germans were essentially sending out drones. 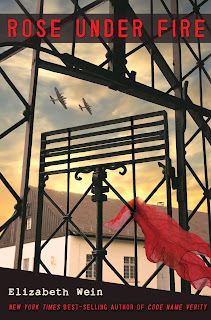 And so I signed on to read how ATA pilot Rose Justice ended up in Ravensbruck, and what happened afterward. I do not, generally, enjoy books set in concentration camps. It kind of seems like "enjoy" would always be the wrong word, yes? 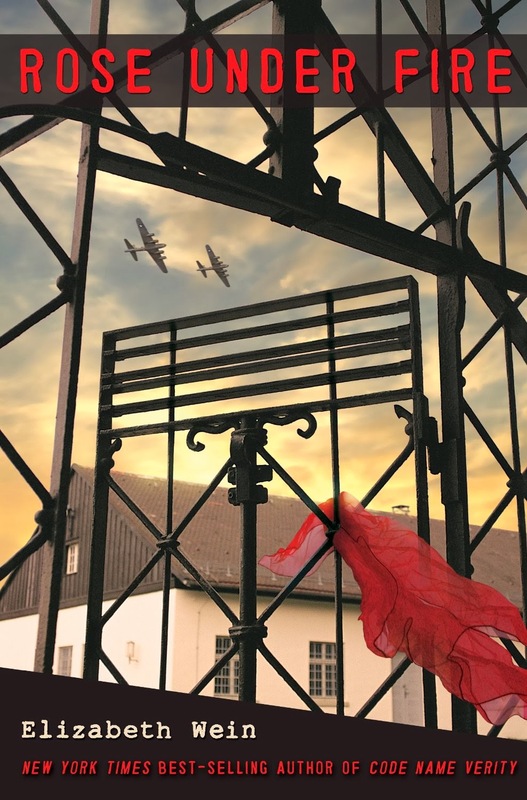 If there's anything about a book set in a concentration camp that's enjoyable, it must be wrong, and otherwise it's just so bleak it's unbearable. Rose Under Fire is saved from either of those extremes by taking a page from Code Name: Verity and focusing on the simple heroism of loving your friends. Rose Under Fire doesn't have that strong central character that Code Name: Verity did, but it does, in its way, have a darker and more painful story. Since Verity was merely trying to use her last moments to greatest advantage, she had that extra strength of knowing she wouldn't have to carry on afterward. Rose is trying to survive, with her self intact. Every woman at Ravensbruck is attempting to do that; the French women rouge their cheeks with beet juice while the Polish women despise them for it, a small detail so human that it broke my heart more than the stories of experimental surgeries did. I've read several places that Rose Under Fire is a story of hope, and of course that's true. But more than that it's a story of humanity, of our flaws and our strengths, and our ability to be at our strongest for someone else, if not for ourselves. You can still peruse books on your kindle... You do that by reading samples of the book. I love reading samples, it really gives me an idea how the author writes and if i will enjoy it. Also, don't forget about the freebie books that you can download. I love reading all the classic authors. I too was a kindle avoider until I got one, now I LOVE it. I kind of sit with it propped on my knee--if I'm sitting sideways on a couch, say, and I press the button to turn the page with the hand that doesn't have the working yarn attached. It gets easy fast! Thanks! I have a stockinette stitch sweater which i want to start, i may try with that. (definitely not the beaded lace shawl I am currently working on lol) And I am also about to knit your baby cowl pattern, thanks for sharing it!